From the days when it was a fur-trading post, Kamloops, B.C. has prided itself on being a transportation hub. Here North and South Thompson Rivers meet. CN and CP RAIL lines run through the town. It's a centre for highway travel in all directions. So, it's no surprise that Kamloops should be a major vantage point for historic travel experiences. 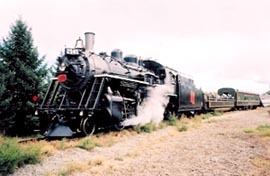 In the summer of 2002 passengers could board a restored 90 year old steam train, chug across a railroad bridge onto the Secwepemc Indian Reserve, experience a train robbery, take a stage coach tour of the city and finish up their day with an excursion on a paddle wheeler, all within a half mile of each other in this city of 100,000. This network of pioneer transportation is a result of volunteer dedication, community support, coupled with a vision of the future and determination to preserve B.C. history. 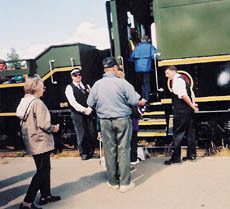 When steam engine 2141 chugged onto the tracks under its own power for the first time in 40 years on June 29, 2002, it was the culmination of 8 years and over 80,000 hours of volunteer labour. The locomotive was built in 1912 in Kingston, Ontario as a coal-burning engine. It spent its early years hauling freight, passengers and mixed trains on the prairies. In 1948 it was converted to burn oil. Its last working years were spent on Vancouver Island. It's the only survivor of the M-3-d class. On July 4, 1958 its 46 years of moving goods across the West came to a halt and it was slated for demolition. Mayor Jack Fitzwater of Kamloops had other ideas. It took him three years to persuade City Council and the CNR that selling the locomotive to Kamloops was a better choice. On Oct. 28, 1961 after payment of $2,000.00 CN operations manager T.A. Mainprize presented the engine to Mayor Fitzwater and the City of Kamloops. 2141, which had been refurbished in the CNR Port Mann yards, became a static display in Riverside Park. Generations of Kamloops children played on the big engine; sitting in the cab and pretending to thunder down the track, throttle wide open. But thirty-three years of weather and vandalism took their toll on 2141. It began to be thought of as a rusty nuisance rather than a historic treasure. There was talk of selling it Alberta. Public indignation was immediate. "Sell our engine? Never!" was the outcry. A non-profit society was formed to restore, maintain, protect and operate the locomotive. Yes, operate. The group of volunteers was determined that 2141 would run again. People said it couldn't be done. This locomotive had had its last maintenance in 1961. How likely was it that 15 to 20 people in limited quarters, with minimal funds, could get it going? The volunteers stuck to their plans. Men brought their own personal tools, lathes, presses, saws and hoists into the shop. They planned to modernize as well as restore the engine. It was a monumental task. Asbestos under-cladding had to be removed and replaced. Many parts no longer available had to be manufactured. Asked what the hardest chore was, one volunteer, after long thought, replied "Clean up of parts and replacing boiler stays." Replacing 247 stays took two years. All were riveted. Sometimes volunteers had to make their own. helped with the repainting and reconstruction of the coach and flat cars. Railway employees and management contributed technical help. Ongoing consultation with the CNR ensured that everything was done to standard. The community began to believe in 2141. Financial donations increased, and City Council supported the enterprise. Eventually 2141 was rebuilt to modern specifications. There was a new brake system. The drivers were lubricated by pump lubricants replacing the employee with an oilcan. And there was a light plant instead of a steam dynamo. It was time for inspection. Fortunately, the old exam still existed. B.C., because of its logging railways, never really went out of steam. In fact, with the interest in steam there are more steam locomotives working now than there were in 1960. 2141 is registered federally but licensed and inspected by the Province of B.C. Safety is paramount with the Heritage Railway Society. All the operating crew must pass five exams before being approved to run the train. They have their boiler tickets, and fireman's training. Of course, many of them have previous experience. One was an engineer for years with B.C. Rail, and ran the Royal Hudson. Car attendants, too, have safety and first aid certificates. Because 2141 runs on the CNR line its travel must be co-ordinated with regular trains. Although the branch line it uses isn't often required, the engineer gets the official schedule of all trains for the day from the Kamloops CNR office. A train requires more than a locomotive. 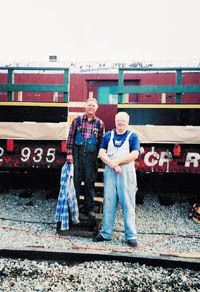 The same meticulous work that went into restoring the engine was given to a flatcar and coach car. Both were brought up to modern requirements. The flat car was stripped down, benches were constructed and bolted to it and a railing put around so passengers would have a glorious 360degree view. The closed coach, CNR #406, was saved from a Montreal scrap yard. 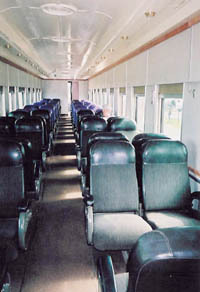 It had been a posh parlour car before being taken over as a first class car by Via Rail. Both cars were sanded and repainted in the original CNR colours. The interior of 406 has small, elegant light fixtures. Much of that work was done by Jill Gould and Valerie Rampone, the two women volunteers. 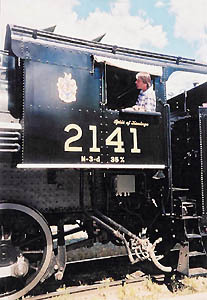 Howard Grieve, a member of the Heritage Society, took on the task of persuading Kamloops Council, the CNR, and regulatory authorities that a running 2141 was a worthwhile venture. His success reflects the careful attention to detail that's characterized the volunteer efforts from the beginning. Today running crew and car attendants are paid, as are ticket sellers. The restoration and maintenance are still done by volunteers. Most of those who began are still with the Society, and still enthusiastic. As Valerie puts it, "I've been involved with many worthy causes, but never with one which is so much fun!" That enthusiasm is passed on to the passengers. Howard describes the goals of the Heritage Railway Society as "Dreams and visions, tempered by reality." Protecting the community's railway heritage is just the beginning. Long-term plans include a full day trip to Armstrong on CPR tracks in 2003, a co-operative venture with the Kamloops Indian Band highlighting the history of the Secwepemec people, and eventually, a railroad theme park. But, right now, it's train time. 2141 is a true photo-op, and engineers will happily steam away then puff up in slow motion for the benefit of cameras. Between trips people are welcome to climb up and explore the cab. The flat car has space for three wheel chairs. Crew attentively guide a wheel chair up the ramp and secure it in a favourable position. Though it's been in operation only since July the train has carried passengers from Japan, Costa Rica, Spain, Australia, England and Germany as well as hundreds of local residents who, like my son, remember old 2141 in Riverside Park. Steam buffs, of course, come from all over the world. All ages, from babies to seniors, are welcome and all have fun. After leaving the station, the train passes the shady waterfront park where 2141 rested for thirty-three years. The train crosses the South Thompson River and runs along the North Thompson until it reaches the CNR Junction, mile 0.0 on the Okanagan Subdivision. Once across the river it passes through the heart of the Kamloops Indian Reserve, a modern, bustling area, the location of many businesses as well as numerous archaeological sites. 2141 goes past a residential part of the Reserve, close to historic St. Joseph's church. The view is splendid. Mts. Peter and Paul dominate the near landscape. Of f in the distance, travellers can glimpse the Lac du Bois, a critical grassland habitat, now and a park. Car attendants have studied local history. As the train clacks along, their informed comments on the surroundings, adds to the enjoyment. On the return trip passengers are chatting and pointing out interesting features, getting ready to disembark. Suddenly, as the train passes a copse of trees, there's the sound of - could it be gunfire? Three masked ruffians on fast horses gallop out of concealment. Is this a train robbery?